This handbook was prepared to provide water system operators and managers with ideas on how to save a significant amount of money by reducing the cost of power necessary to provide water to their customers. As a minimum, the ideas presented herein should enable water systems to lower the cost for power in spite of rate increases implemented by power companies in the coming years. (Summit County)—Saved over $300,000.00 per year on projects throughout their system. (Cache County)—Saved nearly $119,800 per year by adding a new pressure zone. (Salt Lake County)—Saved over $42,000 per year on modifications to a single pump station. Each of these water systems were able to realize these savings by implementing one or more of the strategies listed in Chapter 2 of this handbook. where to look for helpful information available via the Web. All of these changes and facilities, if instituted or constructed, will result in cost savings. The third chapter lists six different funding sources for implementing ideas that save money. A description of these funding sources and the requirements needed to qualify are also provided. The Appendix lists helpful websites and gives a brief description of what the site offers as well as the associated URL. The first step in the process is to perform an energy audit. While the Handbook does not give guidance on this process, five websites listed in Appendix F link to instructions on performing them. It is recommended that water system personnel and consultants perform an energy audit to obtain a baseline of information. Energy audits are required by some of the funding entities. Also, energy audits identify specific unit power costs which may identify obvious opportunities to save money by turning on high energy consuming facilities last and then turning them off first. things that require equipment replacement and/or construction. It should be noted that the line between things water system personnel can do and things consultants could assist water system personnel do will vary depending upon the expertise of the water system personnel. The line between these two arrangements is drawn for the small water systems operator (a volunteer) in this Handbook. The serious water system should consider pursuing all applicable suggestions listed in Chapter 2. When a water system proposes construction and/or equipment changes, the State requires that plans be submitted to the Division of Drinking Water. Such plans must be prepared by a licensed engineer. Ideally, the selected engineer will be qualified to make meaningful recommendations regarding energy efficiency. To help ensure that the “expert” will provide the desired help, it is recommended that the water system go through a Request for Proposal (RFP) process. In essence, the RFP process involves sending out an invitation to multiple consultants to respond. In the response, the consultant provides information which the water system uses to select the best candidate consultant. List the drinking water systems the consultant has worked with and identify the energy cost savings each system realized. Provide contact information for the systems that the consultant worked with. Provide a statement of the specific areas of opportunity for energy cost savings that the consultant feels can be implemented for the water system. State Certified Energy Service Company. Note that the question “how much will you charge” is not asked. This is because the intended project is to maximize the energy cost savings of the utility. As such, the utility will want a more detailed investigation performed by a highly qualified individual, rather than a limited investigation produced by a less qualified expert. From the RFP a water system may select the most qualified consultant and proceed with negotiating a contract. If two or three applicants appear to be equally qualified, an oral presentation by each applicant on the short list may be warranted. Applicants on the short list should be invited to give more detail on their proposal in a scheduled interview. The invitation should list the specific questions that will be asked during the interview. The following questions are examples of what might be included in the invitation and interviews. Use only applicable questions. Please outline the process of investigation you’ll use in identifying the energy saving opportunities available to our water system. Will this process include non-construction actions our water utility personnel can pursue? Please give examples of the non-construction actions. Please identify the most beneficial energy saving opportunities you’d recommend for our water system and an estimated range of savings. Because of budget concerns, we would like to proceed with a capital facilities plan that will enable us to finance future projects with cost savings from earlier projects. Is this possible? Would you be able to prepare such a plan and work with us on achieving it? What funding opportunities do you see as available for us? Is there anything you would wish to share with us that would distinguish you from the other applicants we interview? The object of the interviews is to select the applicant that you’ll negotiate a contract with. Hence the questions selected should be pertinent to your situation and sufficient to stratify the qualifications of the remaining applicants. After selection of the consultant and during the design phase, the consultant should also identify funding sources in cooperation with the water system. Chapter 3 of the Handbook (Funding Opportunities) gives insights on six different possible sources of funding. Some funding may involve all or partial grant funding or cost recovery. Other sources of funding involve loans, with varying loan interest rates and loan time periods. The Appendix includes links to websites that provide helpful information. For example, Appendix B, C, D, and E access information about the various funding sources listed in the document. Appendix F lists websites that provide guidance in performing energy audits. 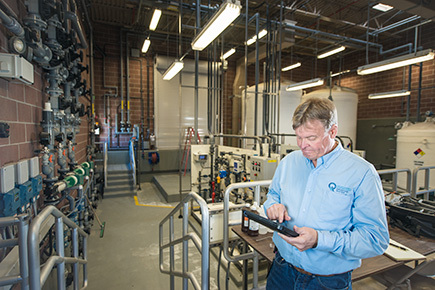 an energy audit that identifies actions a water utility can take to increase efficiency as well as projects that will increase energy efficiency. The Board’s incentive will involve financially attractive assistance to include the energy piece in the master plan. The second incentive that the Board will consider is a reduction in the interest rate for projects that include energy efficient components.